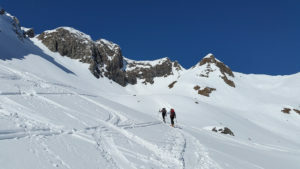 Learn off piste skiing and ski touring with us! 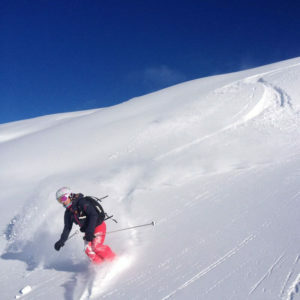 Three days of world-class skiing with top, women-specific instructions from Ex-World Cup ski racer and certified ski instructor Ella Alpiger. 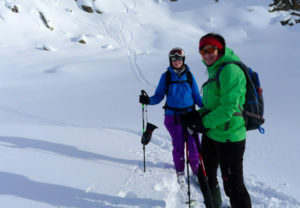 This Women’s ski touring camp features the latest ski and ski-touring teaching techniques, avalanche safety informations and some hidden Off-piste runs. We will base out of the beautiful village of Vallorcine for 3 days of adventure skiing. 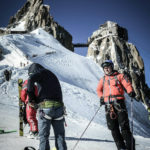 Our goal is to ski the best hidden places for the given conditions, and provide you with coaching and instruction in big mountain skiing. We welcome you at the Chalet in Vallorcine for a first get together. 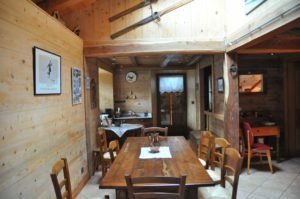 Come enjoy a typical Savoyard dinner with some fine wine from the chalet owners vinery. Off piste work shop in the ski area of Vallorcine / Balme which lies very near the Chalet. We ski where we find the nicest snow. 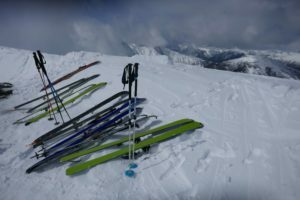 Get tips on your skiing skills and technique to help you improve in a variety of ski conditions and terrain. 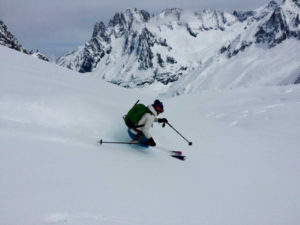 Work on technique and mental preparedness that will improve your skiing in the backcountry, in steeps, trees, narrow chutes and crud. 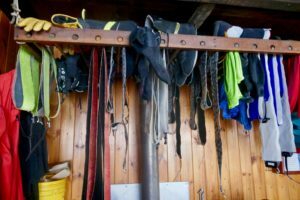 Learn how to search with your avalanche transceiver in the afternoon. An important skill you have to know! Night and dinner at the Chalet in Vallorcine. A short train ride brings us to our Offpiste work shop in the morning in the quiet ski area of Les Marecottes. 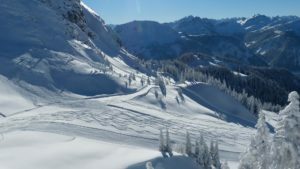 Les Marecottes is a secret spot for powder lovers and offers also some great tree skiing just over the boarder in Switzerland. Practice the tips you have learned yesterday. Now we are ready to bring our back country skiing to the next level. 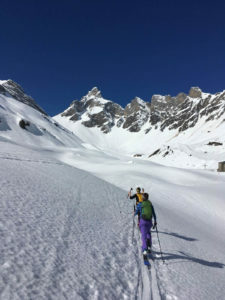 We start with a short ski tour in the afternoon where you learn all about ascending with skins on your skis, ski touring itineraries and snow safety information. 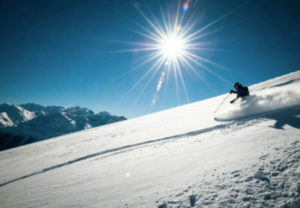 Night and dinner at the Chalet in Vallorcine, enjoy a glas of wine at the fire place and check out today’s skiing videos. With a picknick and all necessary things in our backpack we skin up into the mountains. We use and try all our new learned skills and enjoy a day in the peaceful mountains. The course finishes at 3pm in Vallorcine. The programme is given as an indication only. Changes and adaptation may be made to suit current technical criteria, safety requirements and weather conditions. 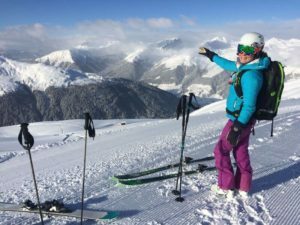 This course makes it possible for intermediate and advanced skiers to move to the next level of expertise in the shortest time possible. 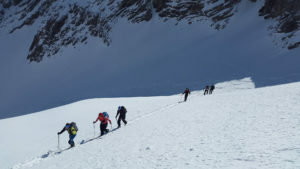 Get confident with the avalanche safety skills and make your first ski touring experiences. All in a group session designed to foster camaraderie. A truly elevated experience. 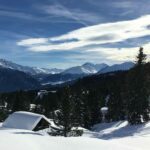 If you feel confident on red and black slopes and have some off-piste experience, you’re ready to join this camp. Please contact us if you’re not sure about your level. The last or first village in the Chamonix valley, Vallorcine is a peaceful mountain village. 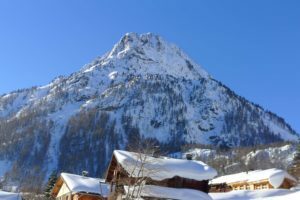 Hidden behind the col des Montets, at the foot of the Aiguilles Rouges, La vallée des Ours (the valley of bears) has retained all the charm of a traditional mountain village. Vallorcine is made up of several hamlets on the foothills of the surrounding mountains stretching to the Swiss border. Here, the mountains never cease to inspire your curiosity and sense of adventure. We can organize a transfers to and from Geneva airport with guaranteed flexibility to match your flight times allowing you to fly from your local airport at a time that suits you. If you’re traveling by train from Switzerland, you can reach Vallorcine via Martigny. We will pick you up at the train station. Nico’s and Audrey’s traditional chalet in a very quiet and peaceful location. 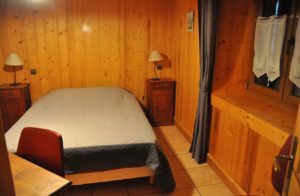 This comfortable, traditional chalet offers breathtaking views of the mountains. 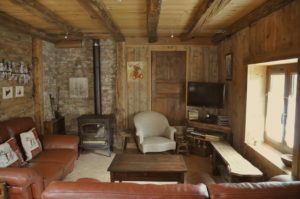 Guests can relax in front of the fireplace with a glass of wine or enjoy the cozy rooms. 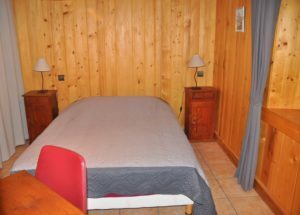 Four tastefully furnished double bedrooms one of them with a privat bathroom and a bedroom with 4 bunkbeds can be found in the Chalet. No WIFI and very little phone coverage – a good break to disconnect and connect with yourself! 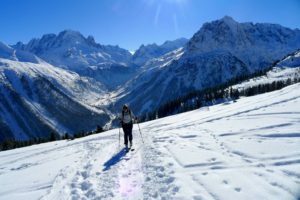 Not included: Transportation to and back from Vallorcine, lunches, drinks, personal insurance, personal equipment (let us know if you need ski touring and avalanche safety equipment, it can be rented). 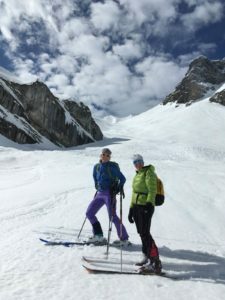 What material should you choose for our women’s ski touring camp? 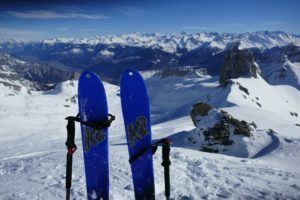 We proudly ski on K2 Skis! 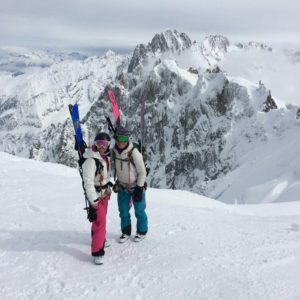 They offer great backcountry skiing equipment especially for Women! 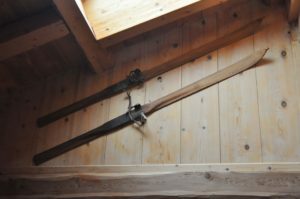 Let us know if we can recommend a ski for you.